Pupil and assistant May 1794 - September 1808. Nothing in the Soane office Day Book for January 1799. 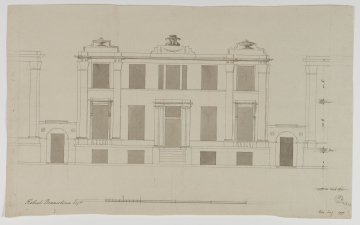 The almost fifteen foot wide passageways to each side of the house may have seemed a waste of space to Soane. It did allow for accommodating useful services such as scullery, boots and knives room etc as well as a footpath to the garden behind the house. Borrowing only three feet from each side, a new five-bay design was made that would probably have had much the same plan but with more window to wall and a striking skyline finish of three plinths with Greek or Roman ornament, two in the form of a shallow urn or 'kylix' with drapery. The urns give sculptural relief to a front that apart from a dozen small discs appears as pleasingly severe.